I was recently at a conference in Cambridge devoted to Cold War that preceded the East-West rapprochement that followed 1989. A number of the ‘big players’ were there, from Eisenhower’s grandaughter to White House men who had served under Reagan, and Gorbachev’s former spokesman. It was an impressive array of Cold War warriors, and enormously educational. But somewhere in the dissection of the whys and wherefores of this almighty clash of ideologies, something was lost. That something was the individual. Looking back at what I have learned about the GDR, what really stands out for me are the stories of the little people. For example, the old lady in Leipzig who had marvelled at the people at the next restaurant table speaking French. Or the woman who had a copy of the proscribed Gulag Archipelago for one night only and stayed up till morning to read it, before this ‘contraband’ had to be quickly passed on. Or the reckless 18-year-old who got himself arrested by the Stasi, gambling (correctly, as it happens) that West Germany would buy his release. And of course the man at Bornholmer Strasse whose father died only months before 9th November 1989. Like my own grandmother, who served as a fire warden in the famously blitzed Coventry in WW2, these people’s names will not be found in any textbooks. Like threads in the swirl of a pattern, their individual tales are lost in the grand design of the fabric of history. But put your face up to the canvas, look closely, and they’re there. They’re everywhere; the big narratives are but the sum of all their short stories. I salute them all. This Friday will see the launch of city-lit Berlin at London’s Goethe Institute. The anthology is inspired by the atmospheric German capital which has captured so many writers’ imaginations – including mine. I have been lucky enough to have some of my Berlin blogging included, alongside some pretty heavyweight names in modern literature. The book has been collecting great reviews, and my own modest contributions were singled out for praise in this FT review. If you’re around – do please come along. 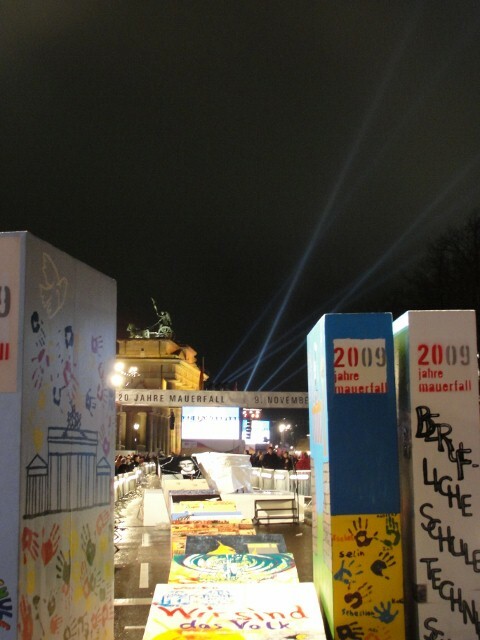 The 9th November anniversary celebrations in Berlin were nothing if not a spectacle. Brown, Merkel and Clinton gave speeches at the highly symbolic Brandenburg Gate that had lain in no man’s land during the Wall era. Gorbachev chatted to Hans-Dietrich Genscher and Lech Walesa broadcast live from the Reichstag. 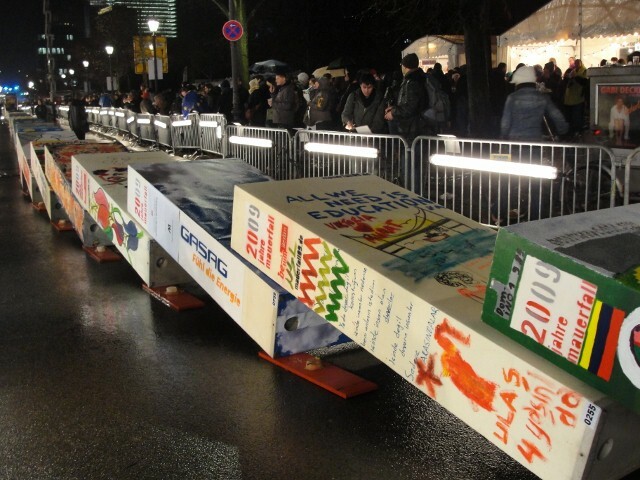 Then 1,000 brightly-coloured ‘dominoes’ – each deliberately reminiscent of a section of the Berlin Wall and each decorated by artists or children – were toppled in a line that ran all the way from Potsdamer Platz to the Brandenburg Gate and almost the Reichstag. Fireworks lit up the sky over the Tiergarten to finish off the official commemoration on this cold and wet night. Mission accomplished all along Ebertstrasse. 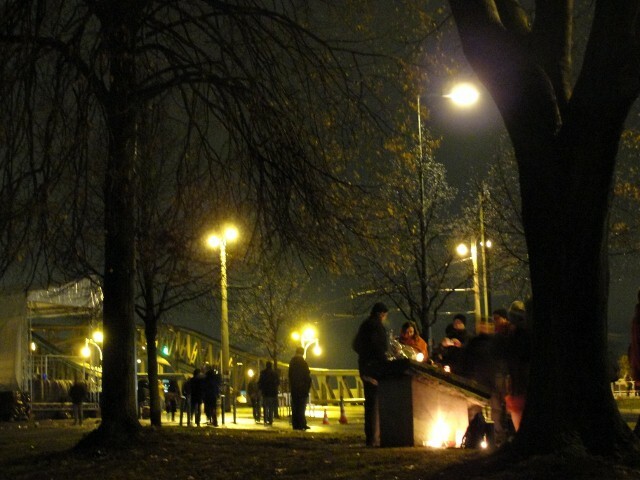 But it was around 11pm that night at Bornholmer Strasse where a low-key sense of history could really be felt. Here, at around this this time of night 20 years ago, the border had given way: countless East Germans had heard the botched announcement about the lifting of travel restrictions and – only half-believing it – came to see if it was true. As S-bahn trains rumbled underneath us, small groups were scattered along the pavement of the Bosebrucke bridge where tens of thousands of eager ‘Ossis’ had streamed across for a taste of what they had been denied so long. There was a murmur of conversation as paper cups were filled with wine and memories mulled over. Every so often a passing car tooted while candles glowed around the base of a monument commemorating the event, serving tonight as a focal point for another cluster of pensive drinkers. People massed here on the eastern side, the approach to Bosebrucke. A man sniffed, eyes moistening, as he explained in German how he had sat in a traffic jam here for hours that night. Only a few months beforehand his father had died, not living long enough to see this marvellous moment in modern German history. At moment that, he said, had actually been more emotional than his father’s death. He shook his head again and again, and said that he came here ever year. It was as if he couldn’t quite believe that it had all really happened. Elsewhere, four women and a man made a toast. I asked them why they had chosen to be here, and not at the city centre razzmatazz? Two of the women had been 21-year-old Berliners in 1989, making the crossing here that extraordinary evening, and their friends had brought them here to remember it. That feeling was still visible, as I walked across the bridge and back to the subway station, on the face of the man whose father had just missed the Wall’s demise. Even though he had been here at Bornholmer Strasse to enjoy it himself, be needed to stay a little longer to really believe it.